Five rockets were fired from the Gaza Strip into Israel early Sunday, the Israeli military announced, following a day of mass protests that saw Israeli troops kill four Palestinians near the territory's border. The rocket attack threatens to undermine Egyptian-mediated efforts to cement a deal that the Gaza Strip's Hamas rulers hope will ease a crippling Israeli-Egyptian blockage of the crowded territory. 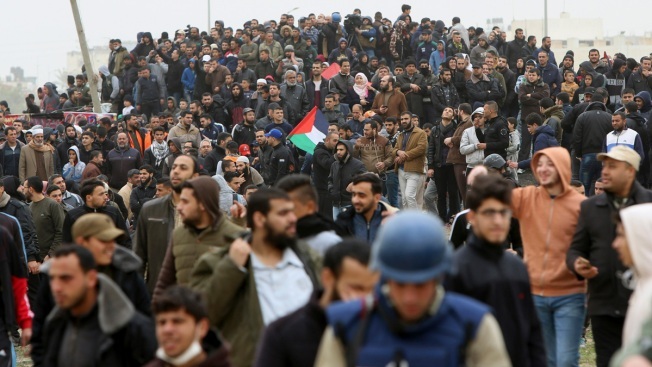 Most demonstrators kept their distance from the border, though small crowds of activists approached the perimeter fence and threw stones and explosives toward Israeli troops on the other side. The forces responded with tear gas and opened fire, killing four Palestinians and wounding 64. Associated Press writer Isabel DeBre contributed reporting.